When a Mariner’s Compass star forms the middle ring of a nine-ring double wedding ring, what do you have? A starry double wedding ring wall hanging. Patterns and techniques used in this class provide the quilter with the ability to tackle two of the most intimidating traditional patterns around. A special new method for setting in difficult seams is being introduced. Those impossible joins? No problem. 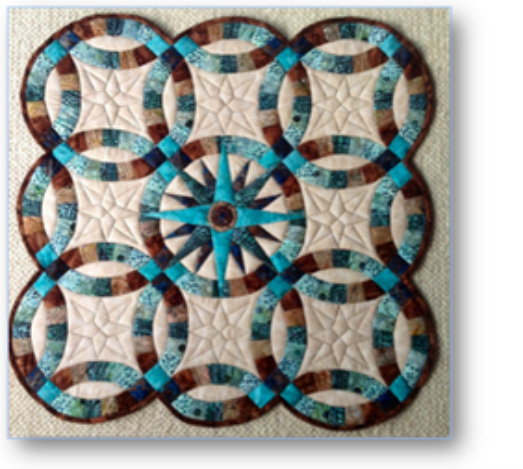 This two day class is for the intermediate quilter. Previous paper piecing experience would be helpful but is not necessary. Pattern (and a secret weapon against annoying seams) included in class kit. Finished project is approximately 28 inches square.